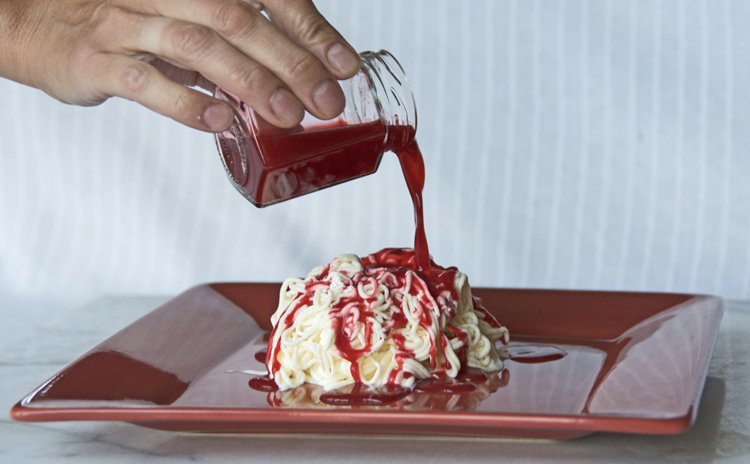 This is not much of a recipe, more an illustrated instruction for assembling this popular ice-cream dish, which is served in virtually every ice-cream parlor in Germany. It takes only a few minutes to make at home. I took my cues from German Girl in America but skipped the cream and sugar and used strained raspberries instead of strawberries. 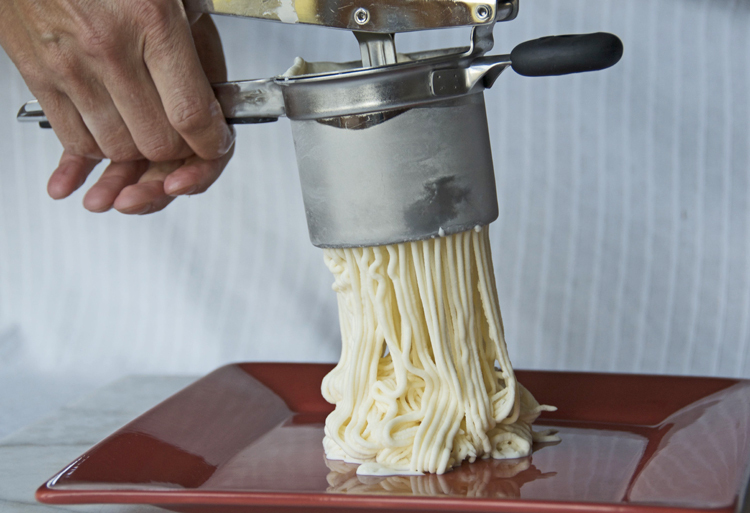 Press slightly softened vanilla ice-cream through a potato ricer (best to place the tool in the freezer for a few minutes before so the ice-cream won’t melt so quickly) onto a large plate or into a bowl (it melts less quickly in a bowl but on a plate it looks more like real spaghetti). 2. 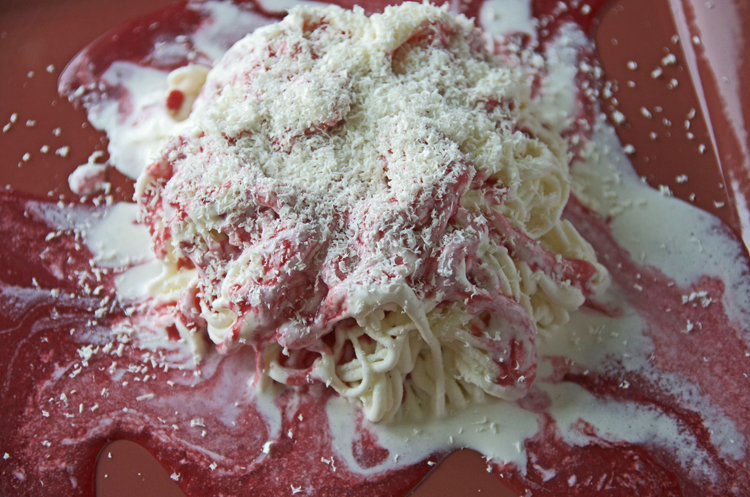 Pour some “tomato sauce” over the “spaghetti” (strawberry, raspberry, cherry, red currant, to taste). 4. 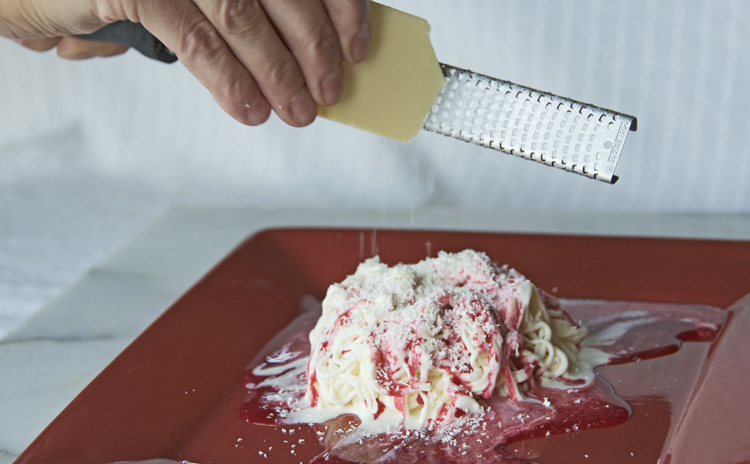 Eat it right away because it melts fast! This is realy my favorit ice. Never thought about to make it by my self, defenetly will try now. Love it one of my favorites! So much fun to eat when I was younger. Oh we had that , my children & I , when we lived in Germany. My husband / US Army. Chrissy, I am a German Girl too 🙂 and everybody has a different taste. I find it too rich with whipped cream under the ice cream, that’s why I leave it out. Patricia, Makes sense! Thanks for pointing that out.